Even during the best of times with our comprised health we must make plans to accommodate our disease. Laura shares. “And God said, ‘Let there be a vault between the waters to separate water from water.’ So God made the vault and separated the water under the vault from the water above it. And it was so. God called the vault ‘sky.’ And there was evening, and there was morning—the second day. And God said, ‘Let the water under the sky be gathered to one place, and let dry ground appear.’ And it was so. And God said, ‘Let there be a vault between the waters to separate water from water.’ So God made the vault and separated the water under the vault from the water above it. And it was so. God called the vault ‘sky.’ And there was evening, and there was morning—the second day” (Genesis 1:6-9). I stood above a mountain of sand, looking out at the view. It was as if I could see forever–miles of homes and the beautiful Atlantic Ocean. It was an easy reminder of the beauty that God has created. We were in the Outer Banks of North Carolina enjoying a week at the ocean during Easter. It was a beautiful location for a week of relaxation; time with our family before the rush of end-of-school activities begins. As my daughter prepares for high school graduation and then college, my husband and boys are finishing up their school year and looking forward to a relaxed summer. I walked the ocean each day and prayed. I really could not think of a better place to thank God for our beautiful environment; our family and friends. I thanked Him for another day, and for allowing me time to relax. I find the ocean so calming and beautiful. Even on days in which I felt exhausted the ocean provided respite. For my kids, they learned I am somewhat athletic. I played a tiny amount of tennis with my crew; showing the kids I can actually serve and volley. “Mom I did not know you were athletic,” said my youngest. There was no need to tell him I needed to stop early as watching the ball was causing dizziness. We had many adventures on the trip, including a visit to the local emergency room for my daughter’s bad case of strep throat. I took her then rested. I needed to rest a lot on the trip and my husband helped by doing day trips and dinners out. I had to choose what I could do. I scheduled one complete day at the beginning of the trip to recover from traveling. I am saddened sometimes that I miss activities, but I would rather do some, than not try at all. And once home, it seemed as if I slept a solid week. It was worth the physical pains to make memories with my family. And I thank God for such an opportunity. Prayer: Dear Lord, as we reflect on the beautiful meaning of the seasons, allow us to continue to embrace this life and the love You provide us. Amen. Laura Seil Ruszczyk lives in New York with her husband of 27 years and three children. She is a retired elementary school counselor who currently runs a HopeKeepers group at her church. She has dysautonomia, the deregulation of the autonomic nervous system. The autonomic nervous system controls such invisible functions as heart rate, blood pressure, breathing and temperature regulation. How do you make modifications in life so you can participate? Do you ever grow sad because it feels like there are enough enough accommodations you can make in order to participate, travel–live the life you imagined? 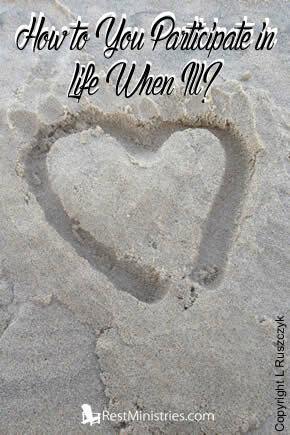 « What is Your Life Magnifying? We all Magnify Something. As always, a thought provoking Devotional. I have suffered from Chronic pain caused by Multiple Sclerosis for several years now so, I have had to make several adjustments in my life in order to participate in the activities that I want. Sometimes I would just arrive early, say at a party, stay for a short Time and then go home early. At least I got to spend some time enjoying the company of family and friends. I’m no longer able to babysit my Grandchildren so my husband comes with me to help on my Daughter and Son-in-law’s date nights. I can no longer garden or cut my lawn so we had to hire someone to do that for me but at least I get to enjoy it. In fact I rarely leave my house other than special events or Doctors appointments . I am a member of Laura’s Hopekeepers group but I’m no longer able to join in due my pain. I have changed jobs several times in order to accommodate for my illness until finally I had to stop working in 2004. It’s so hard to sit on the sidelines of life! I was such an active person and missed out on so much but at least I’m still here! Still able to see my kids and grandkids, still able to help my Daughter with a problem over the phone, still able to watch a movie with my husband. I have been so blessed and the way my life is, is all in God’s plan for me. I have a purpose. I still have a life.